Castleford Tigers forward Grant Millington expects his side to be challenged right away when they begin their Betfred Super League season against opponents he sees as dark horses to win the competition. Australian prop Millington has played in enough games against Catalans Dragons to know that the French team can pose a big threat and he is expecting a tough match at the Mend-A-Hose Jungle tomorrow. With Sam Tomkins and Matty Smith added to the Dragons’ ranks they will not be short of know-how and will provide an instant guide to where the Tigers are at as they begin their campaign. “It’s a tough challenge. In the past they’ve had their problems travelling away, but last year they showed how good they can be,” said Millington. “Round one they are going to be full of beans. They’ve got a really big forward pack and they are aggressive in defence and have lots of strike on the edges, with energy and speed. “They’ve added a fair bit of experience, bringing in Matty Smith and Sam Tomkins at the back. They’ll be a well controlled side, but they’ve got a lot of strike all over the pitch, which is dangerous for us. “But we’ve worked really hard this off season on making our defence a big part of what we’re going to be about so it’s going to be good to get out there and put it to the test for the first time, against a good side. “They’ve been rebuilding in the last few years and they’re a side that can hurt you if you are not on your game. We’ve got to be prepared for a tough battle down the middle to give our edges time to defend and see the game with a bit more clarity. 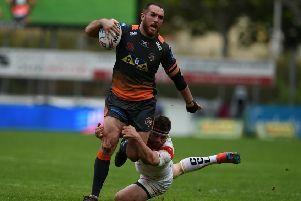 Millington expects Catalans to be one of Castleford’s rivals for glory this year and named a few more dark horses as well. He added: “You’ve got your standard sides that have been good for the last few years and they are all likely to be up there again. But you always get a few sides that surprise people and Catalans, Wakefield and Huddersfield could do that this year. “You obviously need a bit of luck with injuries and keeping a squad together, but there’s a few sides that can really push to make that top four or five. “Leeds and Wakefield have strengthened and that will make for some interesting derbies. These game are fast already – even the friendly we had at Leeds was a really fast game. “Leeds and Wakefield are ones you put a circle round when you look at the fixtures list. We look forward to playing them, but we’ve got a big job here this week first.